It was a lazy Thursday morning leading up to the game, and I debated which hot dog place I was going to hit up. 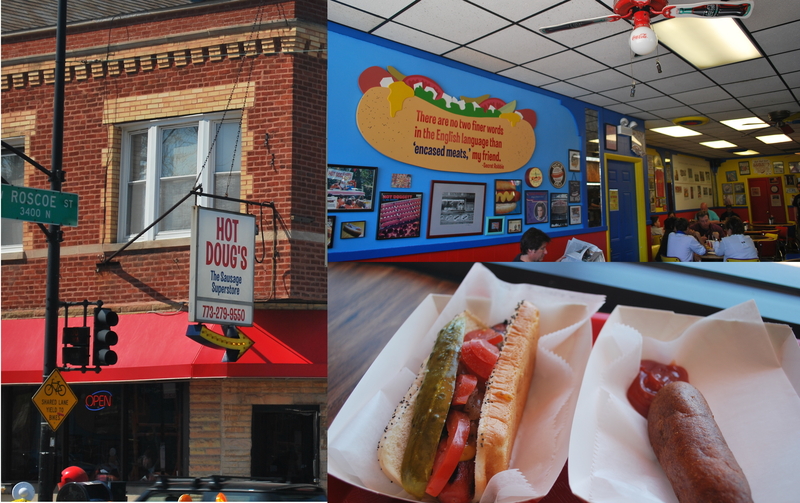 I settled on Hot Doug’s, which is on California Avenue, and is just a short bus ride from Alex’s place. I had never had a Chicago style hot dog before, and thought today was a good day. I really don’t know why I haven’t, I just think I’ve never really had the opportunity. I like all the ingredients that are put on the dog, so there was no reason not to give it a try. Below you have the exterior of Hot Doug’s (which is very inconspicuous), the inside (with a hilarious quote on the wall), and my lunch. I ordered “The Dog”, which is their Chicago-Style hot dog, consisting of a char-grilled dog, mustard, caramelized onions, relish, tomatoes, a pickle, and celery salt. I also got “The Dave Pound”, which is a corn dog. Let me tell you, “The Dog” is probably in the top five things I’ve eaten. It was simply amazing, and am upset that it took me so long to have a Chicago-style hot dog. The line stretched outside by the time I sat down, because it was right around noon. They get stuff out quickly, and it was worth the wait. I’ll be hitting up Hot Doug’s again when I’m back in Chicago in June and August. 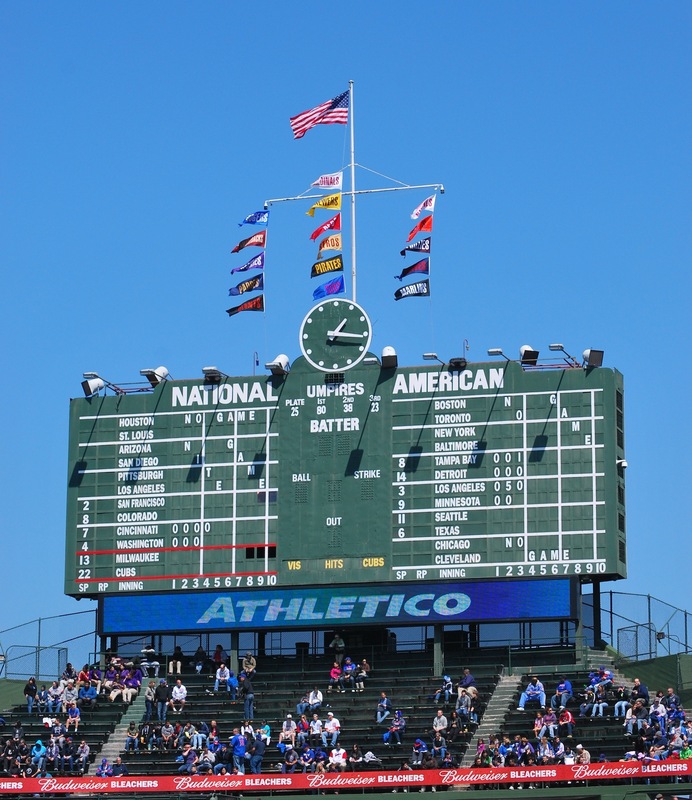 I know it says Chicago Cubs on the back of the scoreboard, but it’s an iconic scoreboard, so yeah. 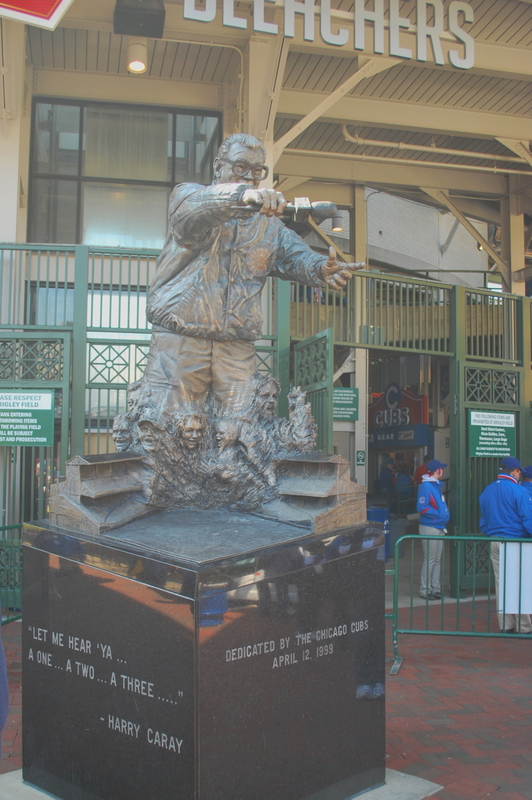 The next photo is of the Harry Caray statue that is hiding behind me in the picture above. Just the mention of Harry Caray makes me laugh, not because I thought he was funny, but because of Will Ferrell. “Hey, if you were hot dog, would you eat yourself? Because I would, I’d put mustard on me….” It’s classic, and it will never get old, for me anyways. I found my seat, which was aisle 33, row 1 (which is actually row 4), seat 4. I got a nice picture of the scoreboard just because I think it’s so cool. I know Fenway Park’s is also manual, but it doesn’t compare. Inside the Wrigley scoreboard there are as many as four workers, moving up and down ladders to keep the in progress out of town games up the minute. I like jumbotrons just as much as the next guy, but not having one is perfectly fine in my book. Since close plays can’t be shown at games anyways, not having one doesn’t bother me very much. The three open tiles on Milwaukee’s line is where you can see people peek out to get a glimpse of the action (not in this picture though). My seat was in the sun today, and I was grateful after the two previous games where I froze. Luckily I remembered sun screen, otherwise my face would’ve gotten lobsteriffic. I took a few pictures early in the game. 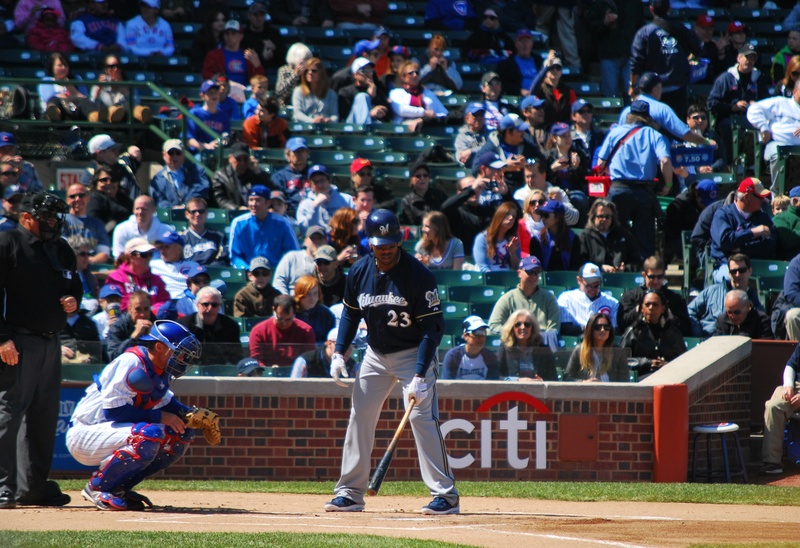 This first one is of Rickie Weeks getting set in the box in the first inning. T-Plush singled in his first at bat and Iorg gave him some love at first (that sounds bad, I know). 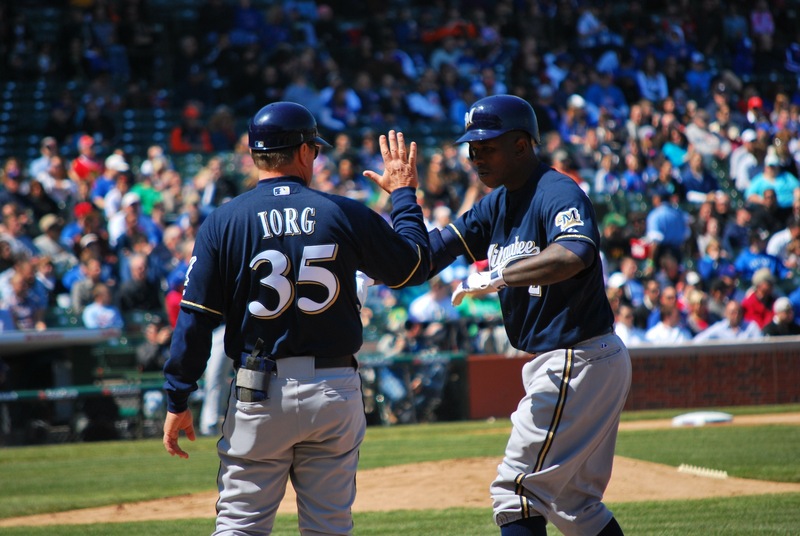 The first inning was probably the closest the Brewers came to scoring a run today. Morgan singled and Braun followed with a walk, but Hart flied to center and Gamel grounded weakly to the pitcher, and that was that. Greinke didn’t have his best stuff, and the Cubs did get some lucky hits, i.e. Alfonso Soriano’s broken bat two run single in the third. The Cubs scored six in the third and two in the fourth. Greinke was charged with all eight earned runs. I’m actually fine that the Crew didn’t score any runs today. If we’re going to give up eight and lose, we might as well not score any, and save them for another day. Don’t get me wrong, I’d much rather score nine and win, but if that’s not going to happen, it doesn’t really matter how many you score. I wouldn’t have been more upset if they lost 8-5 and “wasted” five runs, but I think you see where I’m coming from. Frankly: A loss is a loss. I missed two pitches again today; one in the first and one in the ninth. 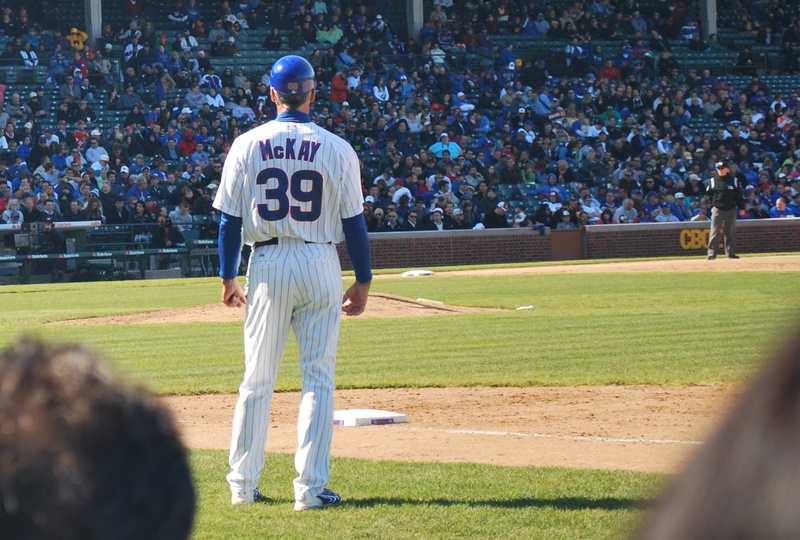 The first was a 1-2 pitch from Greinke to Barney, I think I was tweeting a picture of the view from my seat. The second missed pitch came in the top of the ninth, with two outs. I was gathering my stuff so I could venture up the steps towards the tunnel, and watch the last out from there. Both poor excuses, I’ll try to improve. I am, actually, surprised I didn’t miss 10 or 15 pitches. My view of the pitcher was covered by the first base coach when the bases were empty, and then by the first baseman when someone was on first. As you can see; the pitcher is completely hidden. I had to really pay attention to when the next pitch was coming, because I couldn’t rely on my peripheral vision to help me out. 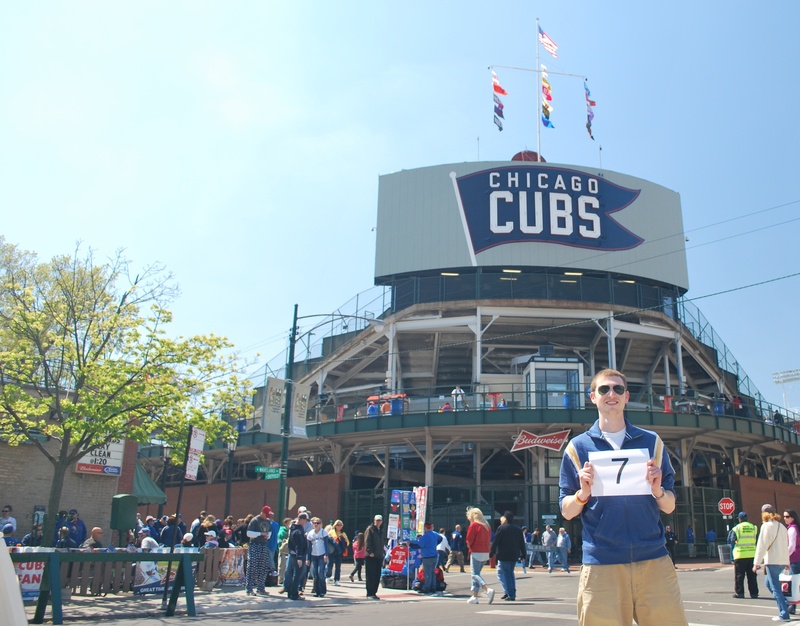 My internal clock helped (besides those two pitches), so I’ll put a W in my column today, just not the Brewers’.